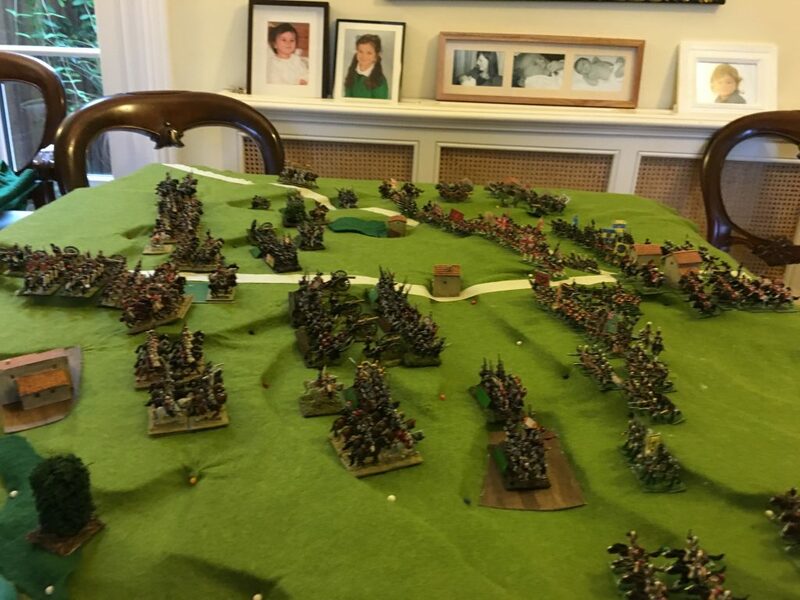 Horse, Foot, Guns is a set of rules by wargaming legend Phil Barker, whom many gamers of a certain age will remember through the Wargames Research Group in the 1980s – which produced a series of ancient period rules of which I still have fond memories. He then revolutionised wargaming with his De Bellis Antiquitatis (DBA) rules which were radically simplified and produced good, short games. HFG has been long in the making. I played an early version a few years ago. It covers the period 1701 to 1914. It plays out on the same ground scale and similar figure scale to Bloody Big Battles (BBB) which I used last year to refight Waterloo. I thought I would try them out on the same battle this year with my friend Rob. The timing proved less than ideal. The rest of life intervened and I did not have the time I would have liked to prepare. The main problem proved to be the rules themselves. They are extremely simple and elegant at core, but they suffer from two problems. First is the breathtaking scope, from the War of Spanish Succession to the Balkan Wars of the 20th Century – basically up to the serious use of aircraft and, more importantly, the use of large numbers of machine guns, and massed indirect artillery. And it isn’t just the date range that is ambitious – it brings in naval elements too. That means there is a lot of unnecessary complexity for a simple land battle in 1815. But it is also quite densely and legalistically written, with many sentences having to be read quite a few times to be comprehended. There is also quite a bit of false economy of verbiage – Mr Barker doesn’t like repeating himself. That means, for example, some key rules on terrain are in quite a different section to the ones on combat where you search in vain for them – also he combines processes, like firing and close combat, that would be clearer kept apart. My solution to this was to produce a cut-down and rewritten version of my own, both to simplify and aid comprehension. Alas I neither had time to finish this, nor try the rules out in a solo game. In reflection of this I cut the scenario down to exclude the Prussians and the French forces they drew off, to give a shorter, simpler scenario – and one that is still quite balanced. I was able to use the same terrain elements as last time, with a cloth draped over contours cut from expanded polystyrene, which I had stored in the loft. I used map pins to fix the cloth and bring out the contours (dampening the cloth with a water spray). This worked very well, except that my pack of pins (I needed all 100) was multi-coloured, so they stood out a bit, as the picture shows. Sadly I did not have time to develop the terrain elements further to give it a more impressive visual appearance. But I think the concept is a sound one. Rivers and streams are the main unsolved problem. Fields and trees need to be added too, the former for purely visual purposes. And I should not be using Mediterranean buildings. The HFG rules work on bases (“elements” – Mr Barker has a careful language all of his own, with “bounds” in place of turns, “shooting” in place of firing, and so forth) with a standard width, each comprising a separate unit. This is recommended at 4cm, and represents 400 paces (i.e. 300m). I used 5cm, as my existing base size for 15mm figures, which also happens to be the same distance scale I use for my DTN rules. I did not fit artillery onto 50mm bases though, and not the “Command Parties” – the senior officer groups – either. These worked OK on smaller bases, though some extra rules would be needed to prevent abuse. The infantry bases were 2.5cm deep, as recommended (or 3cm in fact), but the cavalry were deeper at 5cm. This was following quite a few comments on my Blucher games, where cavalry units with just 4 figures looked a bit pathetic. The bigger (8 figure) units certainly looked a lot better. Pleasingly, this basing format seemed to work OK on the table. Waterloo is a very dense battle, and often defeats wargames basing systems. It was cramped, and it should be, but not too much so. BBB left a little more space, perhaps even too much on the scaling I used. Each base was about 2,500 infantry or 1,500 cavalry – just over 200 men per figure for both arms. I was using the separately published army lists published for HFG, though changed some classifications. The structure of the rules is a clear lineal descendant of the DBA system, which has spread across so many other rules systems. Command and movement is based on “PIPs” based on a D6 roll; each move costs one or more PIPs, but groups of touching bases moving the same way move as single units. Combats are resolved by comparing D6 rolls from each side. This takes getting used to, but it is extremely elegant. Rob loved the essential simplicity, as do other friends who are using the rules. We nevertheless did get a bit bogged down, in large part through lack of familiarity. But it was quite a big battle for two players anyway, I suspect. BBB used not many fewer figures, but played faster. That is partly because it operates through division-sized units, rather than the brigade bases of these rules (and also Blucher and Grande Armée). That will be an important lesson for my own rules, when they eventually emerge! What happened? Like with BBB I played the French and started with Napoleon’s battle plan, except I launched Durutte at the Papelotte complex early – evicting the Nassauers quickly after a lucky throw. Reille bumped into Hougoumont, which we treated as a strong-point under the rules, along with La Haye Sainte. Strong-points are a hard nut to crack under the rules, made much harder by our misreading of them, and I gave up after some heavy losses. After that Reille remained large dormant, bar some skirmishing on the far left. I wanted the offensive on the right to mature before committing strength. On the French right I tried the grand battery for a couple of moves, and quickly decided it was useless. I then sent forward d’Erlon’s infantry (the point at which the picture was taken). But I did not bring along the artillery in close support until much later. On the left LHS proved just as tough as Hougoumont, and over the game I lost 3 or 4 bases (10,000 men…) without coming near to taking it. In the centre I failed to make much impression on the allies, who were more effective at bringing their artillery in support. The French simply did not have enough infantry for the job. After Rob reinforced his cavalry on his far left and started to look menacing, I sent round three units of reserve cavalry (including the Guard lights) to my far right. This caused him to scurry back and refuse the flank. Just to see how the rules worked I threw all three units to attack in a line. They were all beaten off. In fact the historical terrain was probably too cut up by small woods and a stream that I did not bother to represent for the cavalry to have had such freedom. By this time I had brought up the Guard, but after losing a unit on LHS I decided enough was enough. Napoleon had failed. For the French at Waterloo the art is learning how to use superiority in artillery and cavalry to boost the odds for the infantry. This I had failed to do. I needed to bring the artillery up in close support of the infantry. A wider flanking move (given its relative openness on my table) may have worked better too. And the rules? My big criticism is the same as that with BBB: in order to avoid bookkeeping and other tiresome complexity, losses come off in big lumps or not at all. Firepower attacks tend to deliver a lot of nothing, punctuated by the occasional major detonation. This is not a very satisfactory way of representing the attritional tactics that were such a part of the era – notably the use of grand batteries to deliver long range fire. Having said which, once a corps loses one third of its elements it becomes “defeated”, and loses a lot of its effectiveness. This might be something for attritional tactics to aim at. Once two or three lucky throws had eliminated opposing units, possibilities might start opening up. Compared to BBB the rules did seem hard work. That was partly for a good reason: the use of PIPs gives players more work. Another problem was that for BBB each pair of moves is meant to represent an hour, while it is meant to take 3 pairs for HFG. Actually in BBB is looked near impossible for the Prussians to make the historical progress they did – so it doesn’t look properly calibrated. We got through 10 pairs in this HFG game, supposedly 3 hours. This feels better calibrate as the French had not made all that much impression on the Aliies, and still had plent of troops – though d’Erlon was about played out. This took about 4 hours of playing time. To get through the 8 hours (24 pairs) or so of the real battle looks a tall order, especially if the Prussian are there. But that is what I would like to do for a two player game. But how much of the hard work came down to unfamiliarity is the critical question. The real verdict is that it is too early for me to judge these rules. I was frustrated this time, but Rob liked them. And my other friends who play HFG said they struggled at first, but have now come round to them. So I will keep going. For that reason I am not going to publicise this review on TMP – too many premature reviews get on there as it is. But I will be writing up my own, Napoleonic only, version of the rules. Unfortunately ethics, if not copyright law, will prevent me from publishing them.